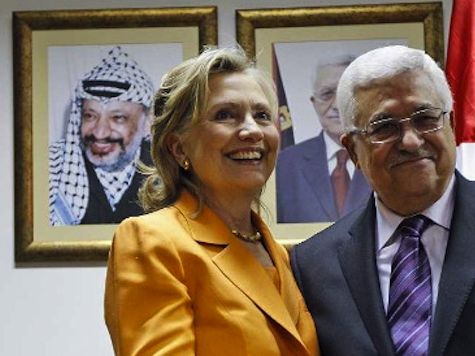 Secretary of State Hillary Clinton has never been a friend to Israel. Today, speaking at the 2012 Saban Forum on US-Israel Relations, a liberal organization, she railed against Israel for supposed insensitivity, lack of empathy, and lack of generosity with regard to the Palestinians – even as the Palestinians unilaterally violated all agreements with Israel and attempted to declare statehood, and within days of Hamas firing rockets on Israeli population centers and bombing a bus. Clinton’s language couldn’t be any more insulting. She endorses the cycle of violence nonsense that endangers the very existence of the Jewish State, and the only democratic and free state anywhere in the region. What more is Israel supposed to “demonstrate that they do understand the pain of an oppressed people”? Commit suicide? Voluntarily jump into the Mediterranean? Why doesn’t Clinton – or anyone in the Obama administration – ever call for more sympathy from the Arabs who continue to cram Palestinians into detention camps in Syria and Jordan more than sixty years after the establishment of the State of Israel? And I think that, unfortunately, there are more and more Israelis and Palestinians who just reject that idea out of hand: Why bother? Why try? We’ll never be able to reach an agreement with the other. But in the last 20 years, I’ve seen Israeli leaders make an honest, good-faith effort and not be reciprocated in the way that was needed. This is slim pickings for anyone with a semblance of morality. For Clinton to even suggest that this conflict continues to be in any way about Israeli intransigence and unfeelingness isn’t just insulting, it’s disgusting. As for the moral high ground, Israel has the moral high ground, but not because they are willing to spill the blood of their own citizens stupidly. They have the moral high ground because they are the peaceful force in the region, the only bastion of human rights, and a bulwark against Islamist darkness. Clinton claimed that she really cannot understand what is going on in Israel …. In a period when the U.S. is working hard with countries around the world to strengthen their civil sector organizations and structures, Israel appears to be moving in the opposite direction, she suggested. Clinton related that she had read a day before in The Washington Post an article by Ruth Marcus, called “In Israel, Women’s Rights Come Under Siege,” which detailed examples of the exclusion or boycotting of women, including incidents where IDF religious soldiers have boycotted events in which women sang, and the segregation of women on some bus routes, in contravention of Supreme Court decisions. The secretary of state related that when she read this report she was reminded of Rosa Parks, the African-American activist who in 1955 refused to yield her seat on a bus to a white man. The boycott of women singing at IDF events reminds her of extremist regimes. That seems more suited to Iran than Israel, Clinton opined. She said that she is at a loss to understand how such processes can occur in Israel. This was not merely insulting – it was ignorant. None of her claims came remotely close to telling the whole story. But this is the Obama administration: anti-Israel to the point of borderline anti-Semitic. Within days of Hillary’s offensive statements, Secretary of Defense Leon Panetta blamed Israel for Muslim hatred of Jews, stating Israel had to take “bold action” to fix that problem. At about the same time, American ambassador to Belgium Howard Gutman told participants at a forum that Muslim hatred for Jews was the fault of Israel because of Israel’s supposed intransigence with regard to a Palestinian state. This was a coordinated assault on Israel, and in particular, on Prime Minister Benjamin Netanyahu. But this is how the Democratic Party now sees the Israel-Arab conflict. It’s Israel’s fault, even when the rockets rain down on Jerusalem and Tel Aviv. If only Israel would give a little more – a little more Jewish blood – then the Arabs would finally learn to love them.